The Creole Case was the result of an American slave revolt in November 1841 on board the Creole, a ship involved in the United States coastwise slave trade. As a consequence of the revolt, 128 enslaved people won their freedom in the Bahamas, then a British possession. Because of the number of people eventually freed, the Creole mutiny was the most successful slave revolt in US history. In the fall of 1841, the brig Creole, which was owned by the Johnson and Eperson Company of Richmond, Virginia, transported 135 slaves from Richmond for sale in New Orleans, Louisiana. The Creole had left Richmond with 103 slaves and picked up another 32 in Hampton Roads, Virginia. Most of the slaves were owned by Johnson and Eperson, but 26 were owned by Thomas McCargo, a slave trader who was one of the Creole passengers. The ship also carried tobacco; a crew of ten; the captain’s wife, daughter, and niece; four passengers, including slave traders; and eight slaves of the traders. Madison Washington, an enslaved man who escaped to Canada in 1840 but was captured and sold when he returned to Virginia in search of his wife Susan, was among those being shipped to New Orleans. On November 7, 1841, Washington and eighteen other male slaves rebelled, overwhelming the crew and killing John R. Hewell, one of the slave traders. The ship’s captain, Robert Ensor, along with several crew members, was wounded but survived. One of the slaves was badly wounded and later died. The rebels took overseer William Merritt at his word that he would navigate for them. They first demanded that the ship be taken to Liberia. 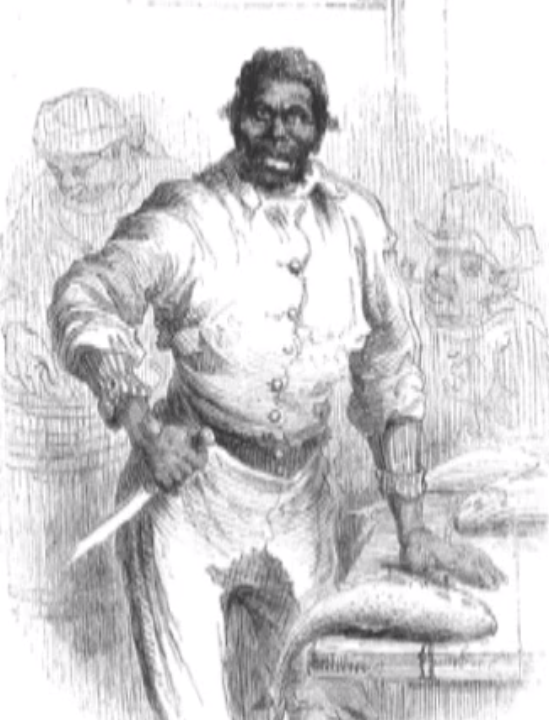 When Merritt told them that the voyage was impossible because of the shortage of food or water, another rebel, Ben Blacksmen, said they should be taken to the British West Indies, because he knew the slaves from the Hermosa had gained their freedom the previous year under a similar circumstance. On November 9, 1841, the Creole reached Nassau where it first was boarded by the harbor pilot and his crew, all local black Bahamians. They told the American slaves that under British law they were free and then advised them to go ashore at once. As Captain Ensor was badly wounded, the Bahamian quarantine officer took First Mate Zephaniah Gifford to inform the American consul of the events. At the consul’s request, the British governor of the Bahamas ordered a guard to board the Creole to prevent the escape of the men implicated in Hewell’s death. The British took Washington and eighteen conspirators into custody under charges of mutiny, while the rest of the enslaved were allowed to live as free people. Five people, which included three women, a girl, and a boy, decided to stay aboard the Creole and sailed with the ship to New Orleans, returning to slavery. On April 16, 1842, the Admiralty Court in Nassau ordered the surviving seventeen mutineers to be released and freed including Washington. In total, 128 enslaved people gained their freedom, which made the Creole mutiny the most successful slave revolt in US history. Arthur T. Downey, The Creole Affair: The Slave Rebellion that Led the U.S and Great Britain to the Brink of War (Lanham, Maryland: Rowman and Littlefield.2014); George Hendrick and Willene Hendrick, The Creole Mutiny: A Tale of Revolt Aboard a Slave Ship, (Chicago, Illinois :Ivan R. Dee.2003), “Creole Case,” Atlanta Black Star, https://atlantablackstar.com/2014/02/07/5-slave-ships-uprisings-amistad/.